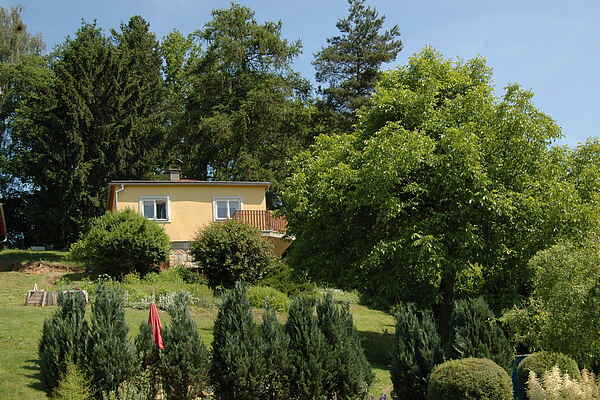 The small but lovely holiday home Mino with private swimming pool is situated in a nice spot at the edge of Turnov. Turnov enjoys a central location in the Bohemian Paradise nature reserve. You are living in an adorable holiday home, colourful and tastefully decorated with wooden furniture and a modern kitchen and toilet facilities. A great place to hang out is the garden, where you'll find sunbeds, a swimming pool and a garden grill. From the sloping garden you have a magnificent view; when the weather is clear you can even see the characteristic fortress ruin Trosky. Holiday home Mino is very suitable and affordable for a small family or a couple. The Bohemian Paradise is a beloved hiking, cycling, and recreational area. With its characteristic sand-rock formations, the many castles and fortresses, and the mixed broad-leaved and conifer woods, it has a very romantic atmosphere. In the Middle Ages, warlords from bygone ages settled in the most beautiful and impenetrable fortresses, or people used them to hide. Castles Valdstein, Kost, or Sychrov are just a few good examples of this. Turnov is a lively city with a regional function, here you'll find shops, restaurants, and nice cafés. For example on the terrain of the local brewery Rohozec, where they brew and tap very tasty pale and dark beer.